PURPOSE To give you the best of both worlds, we have created this plan by combining two of our best-sellers: the Ultimate Plan and the Complete Plan. Starting the first two weeks with the Ultimate Plan, we maximize weight loss with an amazing balance of days that combine juicing along with clean eating. 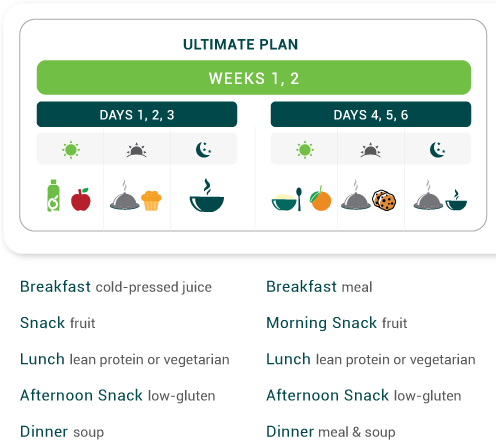 Consistent weight loss continues over the next two weeks with the Complete Plan, allowing many other benefits to shine through: improved digestion, reduced cravings, enhanced energy levels, and an overall sense of well-being. ACTION This plan caters over 4 weeks with: 2 weeks of Ultimate Plan followed by 2 weeks of Complete Plan. With the Ultimate Plan, each week you will rotate between 3 days of juicing along with lunch & snacks , followed by 3 days of complete meals . 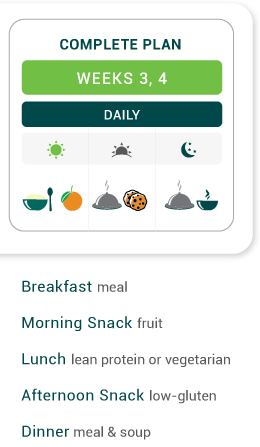 Our Complete Plan offers you three meals a day, one fruit and one healthy sweet snack. Days 1, 2, 3 of the Ultimate Plan consist of: cold-pressed juice (breakfast), fruit, lunch, healthy snack, and dinner soup. Days 4, 5, 6 of the Ultimate Plan consist of: breakfast, fruit, lunch, healthy snack, dinner with soup. Meals will be delivered in our cooler bag on a daily basis between early morning and late afternoon. Juice delivery will be done on Saturdays or Tuesdays between early morning and late afternoon. Follow the number order labeled on the bottles for each day’s breakfast. The three bottles will be delivered altogether in our juice box with number labels on them (Day 1, Day 2, Day 3). Juices and food should always be stored in the refrigerator.